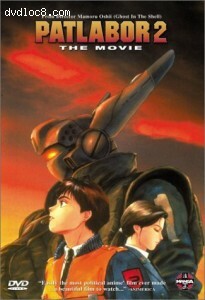 This page contains easter eggs for the disc Patlabor 2: The Movie (DVD, Region 1). The first easter egg can be accessed by going to the Audio/Subtitles Setup menu, selecting the Japanese Stereo option, and hitting left. It should highlight an area to the left of the menu title. The second easter egg can be accessed by going to the Special Features menu, selecting the Manga DVD Catalog option, and hitting left. It should highlight an area in the same spot as the previous easter egg. The third easter egg can only be accessed after the first two are already accessed, otherwise all that will be seen is a screen saying that access is restricted. To get the third easter egg, enter the Special Features menu, then enter the Manga DVD Catalog menu, then select the Patlabor 1&2 option, and hit left. Again, it will highlight a similar spot as the previous two easter eggs.